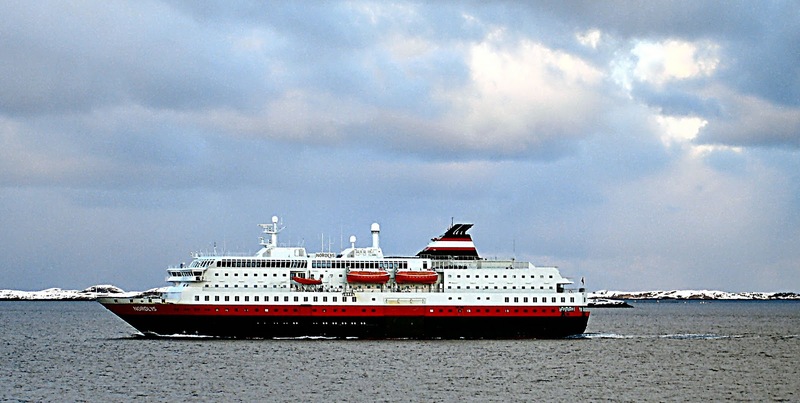 Want to take a closer look at Hurtigruten's ships? While we're waiting for Hurtigruten to bring the MS Nordlys back into schedule, it's possible to take a closer look at her interior here. You can check out the cabins, restaurants, panorama lounges, bars etc. 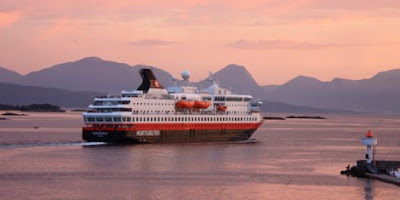 Follow this link and you can get aboard the MS Finnmarken (for the time being in Australia), MS Kong Harald, MS Midnatsol, the older MS Lofoten and MS Nordstjernen, and the rest of the Hurtigruten fleet. I would specially like to point out Hurtigruten's special expedition ship, the MS Fram. What a magnificent ship! 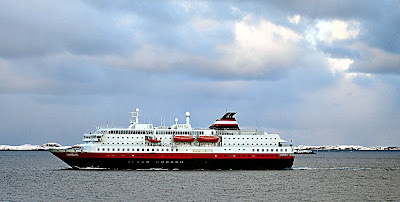 On september 15th 2011 Hurtigruten's ship MS Nordlys had an accident. Close to port at Ålesund in western Norway, a fire broke out in the engine room. Black smoke could be observed billowing out of the ship, and the passengers was gathered on the fifth deck ready for an evacuation. The fire knocked out the ship's engines, and it was left to drift. Fortunately, the ship was just half a mile from the port of Ålesund and the weather was calm. Tug boats came to the rescue and MS Nordlys was towed into Ålesund, where fire fighters stood ready to get aboard. Meanwhile the ship's crew evacuated the passengers into the life boats, and got them all safely to land. Reports has it that the evacuation was carried out in a calm manner, considering the graveness of the situation. No passengers were hurt, but tragically two crew members in the engine room were killed, and another two were injured. As the ship was towed into the port and secured, another problem arose. Along with the water from the fire fighting, the ship started taking in seawater (this was later discovered to be damage made to the ships hull, as it was placed at the quay). This eventually led to the ship listing dangerously. Pumps was placed aboard, but they couldn't get the water out fast enough. Adding to the situation, there was problems finding the damages in the ships hull. For a while all crew working to rescue the ship was evacuated, because it was expected that the ship would tip over and sink. A final effort to rescue the ship was initiated, and the Dutch rescue company SMIT Salvage was able to place enough pumps into the ship. The damages to the ships hull was also successfully plugged. A couple of days after the accident the ships was upright again, and the situation was under control. The ship is now towed to a ship yard for repair. At the Norwegian newspaper Romsdal budstikke's website, you can see pictures from the rescue operation. Hurtigruten, a national icon (and specially after this summers five days live broadcast), has a special place in many Norwegian's hearts. Hours of live television was broadcasted, from the accident was reported to the ship was upright and secured. The reason for the engine fire is under investigation by the Accident Investigation Board Norway. 27.09.11: See also The MS Nordlys accident - an update.